The lungs belong to the respiratory system. The two lungs are responsible for gas exchange between the human body and external air. These exchanges take place in alveoli, in which the blood is enriched with oxygen and depleted of carbon dioxide. The exchange is caused by the difference in CO2 and O2 pressure between the alveolus and the capillary. It takes 0.75 seconds. Blood rich in carbon dioxide is pumped by the pulmonary artery directly from the right ventricle of the heart. In order to oxygenate lung tissue, bronchial arteries carry blood rich in oxygen. The intercostal muscles and diaphragm are responsible for inspiration. The fall in pressure they produce draws air in which fills the lungs. Expiration is a passive effect following muscle relaxation, although it can be forced using the abdominal and intercostal muscles. The respiratory rate is regulated by an unconscious mechanism controlled by the nervous system, which depends on CO2 concentrations measured by chemoreceptors. Approximately 4 litres of air and 5 litres of blood are processed at rest each minute. These figures can rise up to 160 litres of air and 30 litres of blood during intense exercise. The upper respiratory tract (larynx, pharynx) plays a role in warming (bringing the air in the lungsup to 37°C ) and filtering the air to remove bacteria and dust, as the lungs are sterile. The lungs also take part in regulating acid base metabolism and filtering blood to remove small clots. Humans have two lungs, one on the left and the other on the right, which are connected to the upper respiratory tract by the trachea. The right lung is separated into three lobes (upper, middle and lower), whereas the left lung only has two lobes (upper and lower). It is also smaller, leaving space for the heart. The trachea divides into two bronchi, each of which leads to a lung. 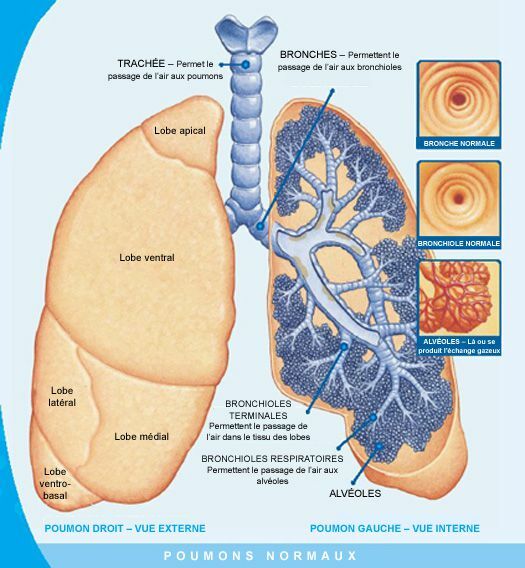 The bronchi divide many times in succession forming bronchioles and ultimately alveolar ducts leading to the alveoli. The alveoli are 0.2 micrometres thick and are made up of pneumocytes and macrophages. The total surface area for gas exchange is 130 square metres.